Kids Comics Awards, Unsinkable Walker Bean, ALA GN Stage & more! We’re on the red carpet getting ready for a special awards edition of the Kids’ Comics Revolution! There are many awards for cartoonists and authors. The Harveys, The Eisners, The Ignatz, and even more in the world of children’s book publishing. And while every one of these awards are terrific honors and vehicles to introduce audiences to worthy works, might not there be room for one more award to specifically honor the authors of kids’ comics? We have a special panel discussion about the Kids’ Comics Revolution! Awards recorded live at the 2013 American Library Association Conference in Chicago, Illinois. We’re we are joined by Aaron Renier, author of The Unsinkable Walker Bean. We’re also joined by librarians Laura Given and Jess Stork Glicoes, who pick up the banners and sound the charge for the Kids’ Comics Revolution! Check out the KCR! Awards Ceremony held at Kids Read Comics 2013! 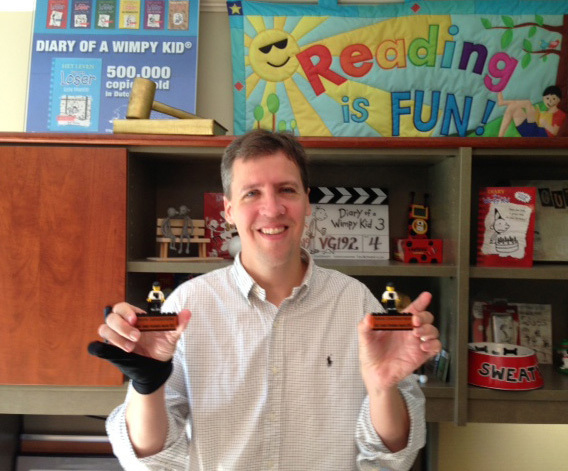 Photo of Jeff Kinney winner of Best Cartoonist and Best Comic/Novel Hybrid in the 2013 KCR Comics Awards! Additional Photos & Complete List of Winners in the KCR! Kids Comics Awards. This episode features a song by Moxy Früvous. Theme music by Harry and the Potters.